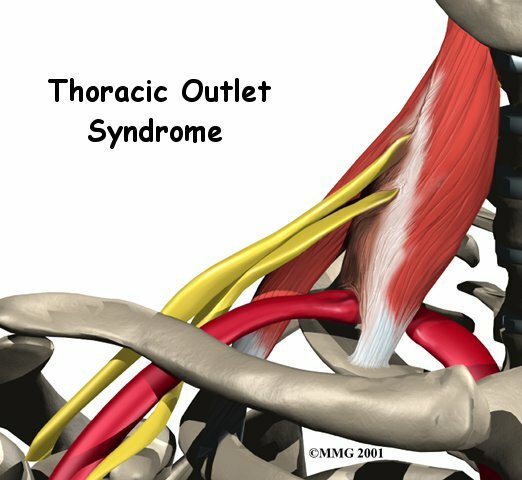 Welcome to Purposed Physical Therapy's patient resource about Thoracic Outlet Syndrome. 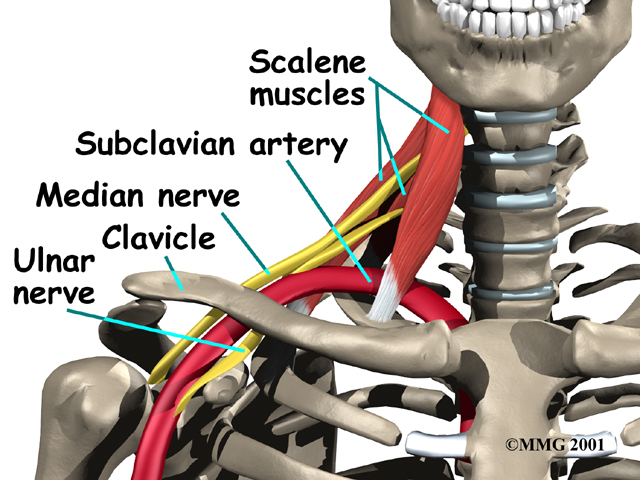 can build up, putting pressure on the nerves and blood vessels at the thoracic outlet. 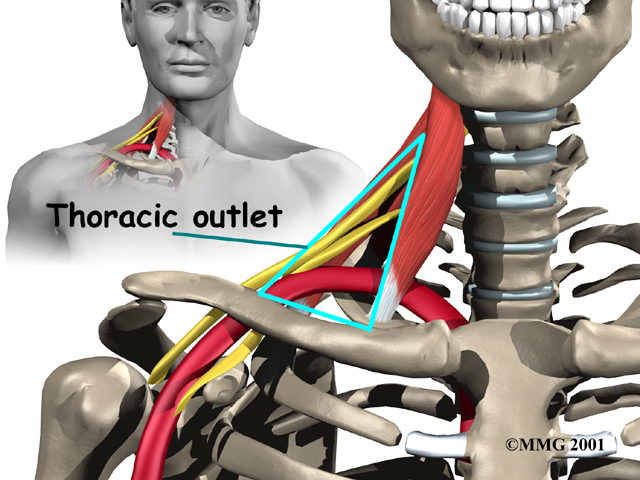 of slouching can compress the nerves and arteries near the thoracic outlet. Being overweight can cause problems with posture, and women who have very large breasts may also have a droopy posture. For some reason, TOS affects three times as many women as men. When you visit Purposed Physical Therapy, our Physical Therapist will take your medical history and do a thorough physical examination. Because TOS is so difficult to diagnose, we will rely heavily on what you report about your symptoms and medical history. It is best to begin treating your pain conservatively, without surgery or other invasive procedures. When you begin your Purposed Physical Therapy rehabilitation program, our Physical Therapist may recommend some simple ways to help you combat TOS. For example, decrease the tension of the shoulder strap of your seat belt. Take rest periods to avoid fatigue. Overweight patients should seek help with weight loss, and women with especially large breasts may benefit from using a strapless long-line bra. Avoid heavy lifting, pulling, or pushing. Rapid breathing and stress can worsen symptoms. 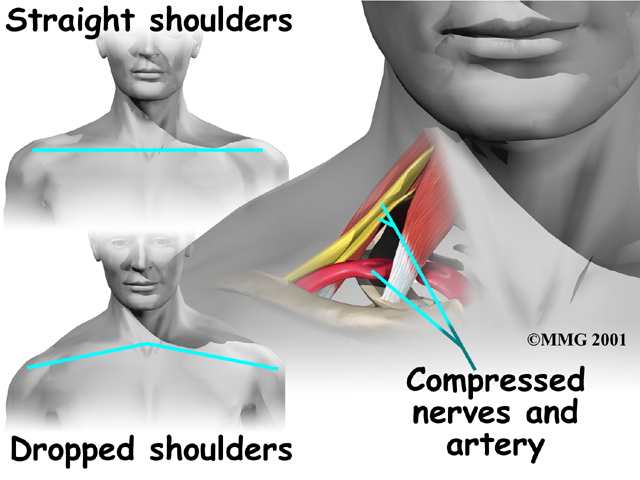 Avoid looking up, bending the neck back, or holding your arms up for long periods of time. And don't carry a purse or bag on the affected shoulder. Your Physical Therapist at Purposed Physical Therapy may start you on some basic exercises that you can do at home. A home exercise program is essential to the treatment of TOS. This is true even if the cause of your TOS is an abnormality in the bones and muscles. You must consistently do your exercises to get the most benefit. Our exercise program may begin with a few exercises to loosen up tight muscles and joints around the compressed nerves and blood vessels. To help restore normal mobility, our Physical Therapist may prescribe stretching for the joints, muscles, and nerves. We can also help you find ways to manage your pain and avoid future problems. You will also be given exercises to strengthen the muscles of your shoulder and upper back and to stretch the muscles in the front of the chest and shoulders. Our exercise program will focus on helping you sit and stand with good posture. Good posture is critical to managing TOS symptoms. Swimming can help some patients, but the backstroke and full breaststroke may worsen the condition. Our Physical Therapist can also give you tips to help avoid TOS pain. For example, you should limit the length of time the arms are used in outstretched or overhead positions, and don't do heavy carrying and lifting. Simple things like taking frequent breaks, changing positions, stretching, or using a hand truck or cart can bring relief. Our Physical Therapist can help you with any specific tasks that cause you pain. In most cases Physical Therapy can be very effective. However, Physical Therapy may not help much if your symptoms are so severe that the muscles of the hand or forearm have atrophied (shrunk). Our TOS patients usually start doing resistive exercise and activities after three to four weeks. These treatments help improve motion in the shoulder blade and arm. Posture and strengthening exercises help prevent future TOS problems. Our Physical Therapist will give special attention to the type of work you do, and may have suggestions to help you avoid work postures and activities that could cause problems. We’ll show you strategies to take care of any future symptoms and avoid further problems. When your recovery is well under way, regular visits to Purposed Physical Therapy will end. Although we will continue to be a resource, you will eventually be in charge of doing your exercises as part of an ongoing home program. When diagnosing your problem, your doctor may order an X-ray. The X-ray could show an extra cervical rib or other problems with the bones and joints, such as arthritis. Your doctor may also ask you to get an magnetic resonance imaging (MRI) scan or other imaging tests. MRI scans use magnetic waves to show pictures of the bones and soft tissues of your body in slices. 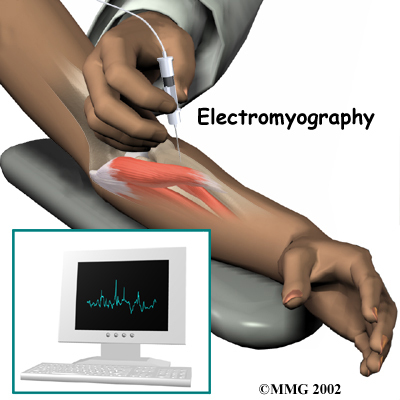 X-rays and other imaging tests are mostly used to rule out other problems. Your doctor can prescribe some types of medicine to ease your discomfort. Nonsteroidal anti-inflammatory drugs (NSAIDs), such as aspirin and ibuprofen, can relieve pain and inflammation, and muscle relaxants can relieve muscle spasm. Some patients who experience chronic pain, such as the pain of TOS, end up battling depression. In these cases, anti-depressants can be very helpful. 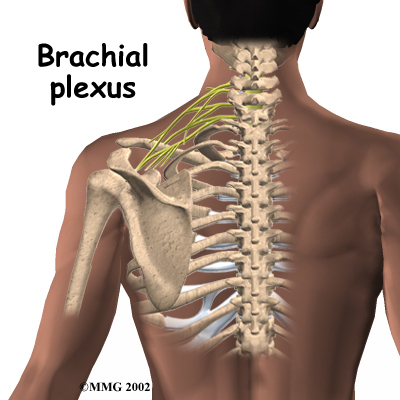 The brachial plexus is the network of nerves that go to the hand and forearm. 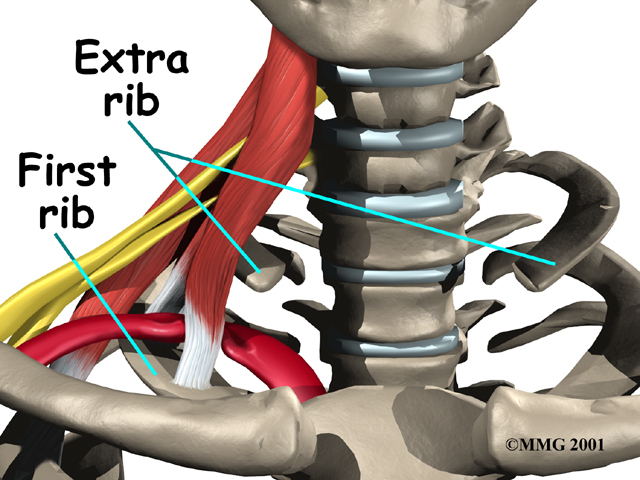 If there is an extra rib, it is usually removed. Otherwise, surgery consists of simply releasing the constricting elements and scar tissue around the nerves.